A day of little surprises! Two best friends for Valentine's Day! Well, today has been a bit of a mixed bag! It started in a lovely way, with Kerryanne English of Shabby Art Boutique letting me know she'd popped something special on her blog that might interest me - and lo and behold! There were some GORGEOUS photos of a Cupcake Katie doll that I sent her last week as a 'just becausee' gift! 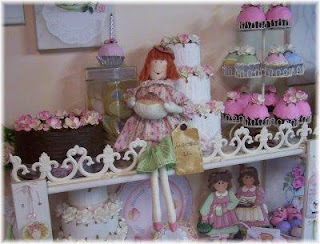 How lovely to see Katie enjoying her new home with Kerryanne - especially the photo of her amongst the faux cupcakes!! I borrowed this photo from Kerryanne to show you! Doesn't she look right at home? To see more of Katie's adventures pop across to Kerryanne's blog - her roses are GLORIOUS!! So ... that was a nice way to start the day. Then I did the housework thing by putting a load of washing in. While I was waiting for the washing machine to do its thing, I decided to have a little peek at the Lilly Cottage blog, which Kerryanne had mentioned on her blog. An hour later and I was still happily reading my way through the archives, but decided I'd better hang the washing. Now, it was at about that moment that I heard an ominous 'click'. No, not my brain exploding from thinking, the safety switch on the power box. So, off I went to investigate, my first stop being the laundry to check the second fridge - which was delegated second spot after a few similar incidents! (but the husband feels he MUST have a drinks fridge!!! Sigh!!) Plus, while there I thought again about hanging the washing. A step out my back door and I didn't know whether to call an electrician, a plumber or Noah to come and rescue me!! Water, water everywhere! The hose from one of the taps to the washing machine had somehow been stretched at an odd angle and was shooting a fairly constant spray of water out - right on to the power point that powers both the fridge and the washing machine! Aha! Gurgle, gurgle!! I thought I'd found the culprit! After some extensive searching (where the heck does one find a spanner/shifter/tap-without-a-tap tightener!!) I found an overly large shifter that did the trick of stopping the water, unplugged said chords from powerpoint and thought that should do the trick. After leaving soggy footprints up the hallway (I knew there was a good reason to opt for timber over carpet!!) I tried to re-engage the safety switch. Nope. So then I began a process that would have been really funny - had I been watching rather than participating in it!!! I would unplug an appliance and return to the safety switch to try it - thus hoping to work out exactly which appliance was the guilty party. After about a dozen trips back and forth (I didn't realise we had so many power points!! Why can we still never find enough?!?!) everything was unplugged except the computer, which I knew from past experience (the joys of owning an old house!!) was on a separate power board and unaffected and still the safety switch wouldn't 'switch'! So I did what any self-reliant, liberated woman of the new millenium would do - I called Scott!! Who promised to call an electrician for me - since the cordless phone doesn't work without power and a search for an electician had the potential to involve LOTS of calls! He called back soon and said someone would be out later in the afternoon and to just sit tight til then. Well ... what else was I likely to do with no power!!! However, I took the opportunity (after finally hanging the washing!) to settle down in front of my computer and spent a happy hour - or two!! 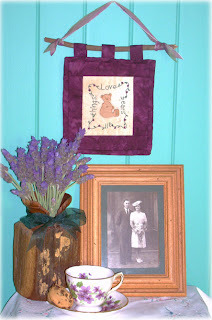 exploring the Lilly Cottage blog and getting to know Linda and Laura a little better. I've decided my next 'play date' with Lynette will have to include an excursion to Lilly Cottage to see their fabulous goodies in person! So... as a result, I have NOT had a productive day! I couldn't even boil the kettle for a cup of tea to calm my nerves! And the most frustrating part of this sad tale is that when the electrician arrived (thank you Owen, my hero!) he poked at the powerboard, tapped the fuses, switched the safety switch - and the rotten thing stayed on!!! I just don't understand! Owen was as befuddled as I so I felt a little better! He tested all powerpoints and concluded that it was just one of life's little mysteries, before heading off on his merry way! Sigh! At least I 'met' some new cyber friends and enjoyed drooling over lots of 'pretties'!! In the midst of all of this, I heard the sound of laughter and thought the fairies were making sport of me, until I stepped out the front door and found a very handsome fellow looking down at me. Isn't he lovely? I forgave him for laughing at me and chose to believe he was laughing at the silliness of life in general and not me personally. 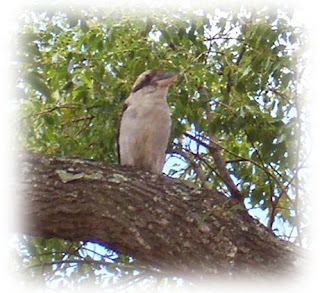 There is something about kookaburras that catches my imagination. We don't hear them very often, but just recently, we've had a pair move into the trees around our block and I often hear them chortling away to each other. Scott laughs at me because every time I hear them, I head outside to see if I can see them!! Today, I did! He helped me to remember my sense of humour and to laugh at the funny mental picture I had of myself traipsing back and forth between powerpoints and safety switch! Yes, I've been out and about today, so no sewing done, although I stitched hard last night - more about that later! Today, I caught up with a good friend, Robyn, who I used to get together with once a week to stitch, but life seems to keep interrupting these days and our schedules rarely match. Today, they did, so we hit the road! We headed off to the Danish Dried Flower shop, where we admired their extensive range of dried flowers, beads and other arts and crafts supplies. We then decided we needed lunch to keep our shopping strength up, so ordered some tasty treats. Here's Robyn enjoying lunch. Fortified once more, we hit the road again to visit Highfields - a growing suburb about 10 minutes north of Toowoomba. Here, we stopped off at the Village Green complex where we visited Herbal Harmonies. Herbal Harmonies is a fabulous little shop that has all sorts of pretty 'smellies', from soaps, hand creams, talcum powders and body sprays to scented candles, flavoured teas and spice mixtures, not to mention a huge range of giftwares. Gleeful rubbing together of hands!! I was on a mission to buy a birthday pressie for my Grandma, who I'll be visiting this weekend in Bundaberg. Mission accomplished! A pretty weekly planner, potpurri hanger and rose scented talc were purchased and are ready to wrap. We then decided we needed a caffeine boost to sustain our spree, so popped into the Chocolate Cottage Coffee shop - about 20 steps from Herbal Harmonies!! 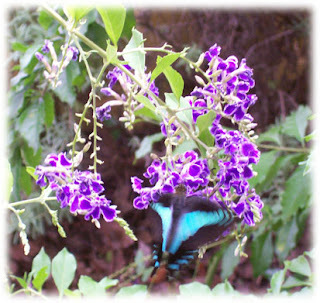 That's the great thing about the Village Green complex, there are five fun-filled shops in a 'village green arrangement, looking out over spectacular valley views from Toowoomba's bit of the Great Dividing Range. Our caffeine boost then took us to The Quilters' Angel patchwork shop where I bought a couple of lovely hangers and a piece of fabric that will make great pirate pants - you'll just have to wait and see about that one! We then trundled off home, tired, a little lighter of wallet, but happy - plus we had a great time chatting and catching up! 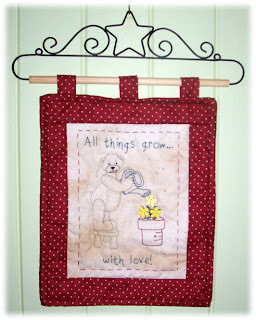 This is the prototype of my latest pattern, another Card Kit and the stitchery says, "All things grow with love!" It features some cute yellow timber buttons from my friend Lisa at Button Bliss and will be available for sale - just as soon as I write the instructions!! Groan!! I think next week had better be set aside for instruction writing, as my clever stitching fingers are getting ahead of my instruction-writing. 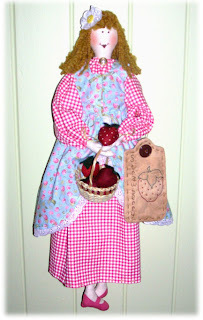 She carries a cute cane basket full of strawberries made from fabric and felt, as well as holding a ripe, plump strawberry in her hand. On her other arm is a swing tag with "Strawberry" stitched on it and in her hair is a strawberry flower. 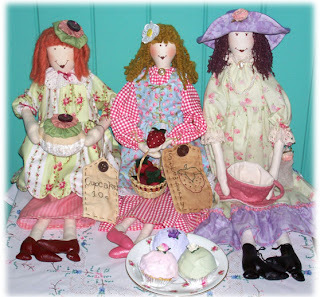 Now I just have to write some more instructions and she can be added to the web site with her Tea Party Pals. They got together for another 'practice' tea party with some of Kerryanne's cupcakes, it was after all a dreary day that needed brightening with good friends and cups of tea! Aren't they cute? I've had lots of fun designing and making these dolls and hope others enjoy them too. My poor postie has gone home for a cup of tea and a lie down to let his nerves settle, I think, after two VERY exciting packages arrived in my mailbox today!! You know those Gold Lotto ads where the very excitied 'set for life' winners go rushing out to their mailbox?? Well that was me today!! Tee! Hee! Hee! Oh what goodies I found in that little white box! You see, I'd ordered some mini faux cupcakes from Kerryanne at Shabby Art Boutique and some timber buttons from Lisa at Button Bliss. And after much anticipation, they all arrived today!! 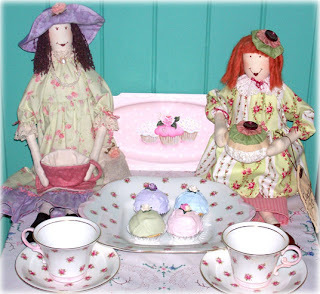 I've drooled over Kerryanne's range of faux cakes for quite some time and finally had the excuse I needed to order some - a display of my Tea Party Pals cloth dolls and patterns is coming up at Quilters' World and Kerryanne's goodies are just perfect to help display Cupcake Katie, Tea Cup Tilly and (in the design process!) Berry Basket Bonnie! Have a look and you'll see what I mean! You can see Tilly and Katie having a 'practice' tea party! If you haven't checked out Kerryanne's FABULOUS range of goodies at Country To The Core and Shabby Art Boutique yet, you really should - but make sure you put a plastic cover over your keyboard for when you start drooling!! And buttons, buttons, BUTTONS! I've designed a couple of new stitchery projects to feature Lisa's wonderful laser-cut timber buttons, including the "Love Bears All" hanging featured in an earlier post, and now that these goodies have arrived, I can package up the "Love Bears All" card kits ready for sale and get stitching on the prototypes featuring the cheerful yellow daisies and busy bees below. Both Kerryanne and Lisa received VERY excited emails this afternoon! Tee! Hee! Hee! Will keep you updated on the display and the new stitchery projects! I also shook off the last of my "Blah!" mood from earlier in the week and slaved over a hot drawing board today. My ironing board used to be the drawing board, as my sewing desk is too crowded, but I've now claimed the office for my designing, as my beloved 'Geek Boy' works on a notebook computer in the lounge room these days and only uses the office as a dumping ground for anything that doesn't have a home. I'm part way through designing the third of my Tea Party Pals dolls, so watch this space for updates, because the fabric I bought for her outfit is GORGEOUS!! It jumped out and said "Take me home!" Tee! Hee! Hee! FRIENDS!!! I don't know about you, but sometimes I have a day or two where I just feel (in Charlie Brown's words!) "Blah!" You know ... nothing specific has happened, you're not sick, sad, mad, frustrated - you just don't feel good. On those sort of days, I'm particularly thankful for my friends! I have to admit to having a couple of "Blah!" 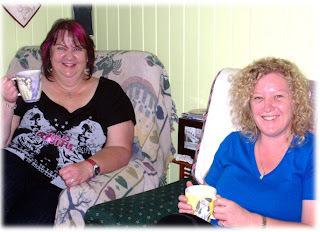 days this week, but thankfully, my two belly dancing buddies, Deb and Lynda, were on hand to have a cuppa, a chat and a giggle to make me feel better. We all met when we were attending weekly belly dancing classes. (I know - there's a mental picture you could probably have done without! Tee! Hee! Hee!) Then, we started going out for coffee after our class, then lunch, then we started getting together outside of our dance class times and before you know it, we became the Triple Trouble Trio!! We come from different backgrounds, different life paths, yet somehow, we find common ground in the shared outings, cuppas and laughter. The friendship has grown and flourished, so that we now know we can lean on the other two for support. In the language of our belly dancing - we've formed our own tribe! So ... today, I am VERY thankful for my friends! May you be blessed with some good friends, too, and remember to let them know how special they are to you, because they are more precious and rare than diamonds!! I don't know how many of you remember a TV show from the '80's called "The A Team" which featured Mr T and Dirk Benedict (what a honey!) but one of the characters had a saying: "I love it when a plan comes together!" Well, that's the kind of day I've had today. 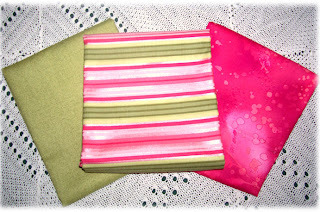 A couple of posts ago, I shared a photo of some funky green and fuchsia fabrics that I'd bought to make the sample for my latest pattern, one that will be donated to Fresh Hope Patterns. After a few interruptions (I'm easily side-tracked!) I spent the afternoon slaving over a hot sewing machine to pull it all together. Take a peek. Not a cushion that can be ignored, I know, but it seemed a joyful, fun and funky colour combo and since Fresh Hope is an organisation that inspires joy as well as hope, it seemed appropriate! It also ties in with the candy-stripe pattern that is used on Fresh Hope pattern covers and web site etc. 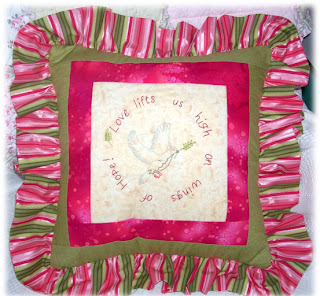 and it features a dove, which is a symbol used by Fresh Hope and FH Patterns, The wording says: "Love lifts us high on wings of Hope!" Now I just have to write the instructions - groan!! Not my favourite passtime, but at least I heeded some sage advice from Kerryanne and took detailed notes this time! I also took time this weekend to drop in on a new blog that I apparently helped inspire. I was chatting to Lisa from Button Bliss on Friday (Yay! Button order coming my way soon!) and she said that after I told her I'd started a blog and how much fun I was having with it, she decided to give it a go. So pop in to say g'day to her at buttonbliss.typepad.com. I love Lisa's funky country graphics almost as much as I love her timber buttons! Hmmm, I'm starting to think that blogging is contagious, as I now know of a few people who've 'caught the bug' from a friend. Good thing there are few harmful side-effects! Well, today was Valentine's Day - did you get spoiled? 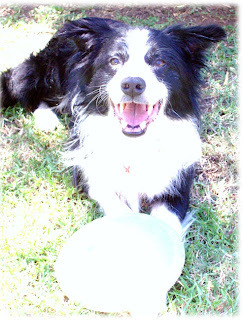 I did, in a way, as I got to spend the day 'playing' with my best friend. Now I know I've said in my profile that I've been married to my best friend for 15 years - that would be Scott AKA Geek Boy - but you see, I have a second best friend, or perhaps I should say a first!! Have I confused you now?!? What if I explain that I have TWO best friends! My first best friend's name is Lynette and we've been best buds since we were 9. Other friends came and went over the years, but it was always the two of us, to the point where if one showed up alone, people would ask, "Where's the other one?" To look at us, we are complete opposites, a bit like Laurel and Hardy - Lynette has always been tall, often blond, blue-eyed and athletic, while I - am not!!! Tee! Hee! Hee! We followed very different career paths when I went to uni to study Journalism and she became a nurse. 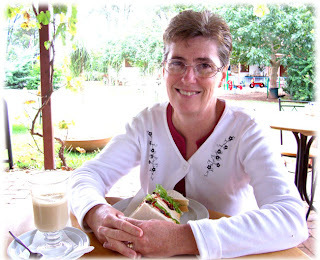 Lynette lives in the 'big smoke' suburbs of Brisbane, while I've mostly lived in rural communities. Yet through it all, the friendship has remained, grown, evolved and come out the other end even stronger. Aren't I lucky!! She even trusts me to be Godmother to her youngest daughter!! We share a warped sense of humour and often speak in half sentences because the other instinctively knows how the thought ends (the husbands just shake their heads and call for an interpreter!) and often call each other only to find we were both thinking of the other - to the point where we joke about sharing a brain!! I met Scott when Lynette and I went to a singing/music/art/dance/drama camp during school holidays and he quickly became my second 'best friend'. Whew! Are you REALLY confused now!! Tee! Hee! Hee! So ... Lynette lives just over an hour from me, so every six to eight weeks, I jump in the car and head down the range for a 'play date'. Sometimes, we explore new suburbs with cute, funky boutiques, sometimes we spend the day in a coffee shop and sometimes we just curl up on her couch with cuppas for a good chat! In short, we 'play'. Today, we headed to a fantastic garden centre that also has a gorgeous gift shop and a very nice coffee shop, where we browsed and enjoyed lunch. 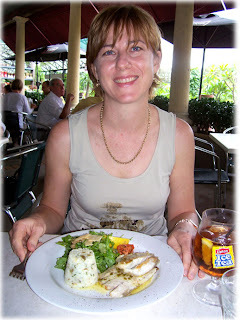 Here's Lynette about to tackle a very tasty serving of barramundi. We then wandered through the gift shop where I drooled over some gorgeous shabby chic bird houses and a cookbook boasting 500 cupcake recipes (must add that one to my birthday wish list! ), I bought Lynette her late Christmas present of a bromiliad (decided not to post that one!) and we raced back to be on time to pick up her kids from school - only to find she had misread her new watch and we were an hour early!! Probably the only time in the history of the world this has happened as we both perpetually run late, especially when we're together!! Tee! Hee! Hee! So ... we did the only logical thing - we found another coffee shop! Then an hour later, at the correct time, the kids were collected (headcount - do we have enough?!?) and feeding time at the zoo took place. Of course, after the kids had been subdued with snacks, we needed another cuppa!! 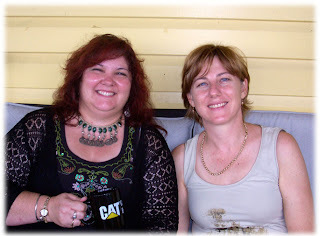 Here we are on Lynette's back verandah, relaxing after our 'hard' day! I then came home to exchange chocolates for Valentine's Day with Scott - it seems great minds think alike! Mmmmm Raffaello!!! And then we did something REALLY romantic together - we did the grocery shopping! Life's what happens when you're planning something else! As you can imagine, I finally gave in! Then, I sidetracked myself further when I decided to make a 'just because' gift for a friend. Of course, even amongst the many pieces of fabric in my stash I couldn't find just the right ones, so off I trotted to see Pauline at Quilters' World again - I told her I may as well move in there this week and she commented that she's often there at all hours herself when she can't get to sleep for all the ideas running around in her head! So back home I went and had barely got settled to start cutting out, when I heard the puttering of the postie's bike, so I headed for the front door to check the mail and spied two of the most gloriously coloured butterflies I've seen in ages. 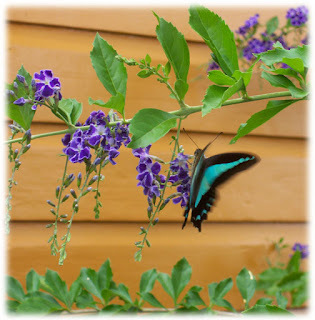 They were happily playing amongst the flowers of my overgrown cottage garden, flitting from the lavender to the Geisha Girls. Aren't they a gorgeous aqua! Oh, and as a bonus you get to see what colour the front of our house is! Tee! Hee! Hee! You'll be pleased that I eventually came in from outside and got back to sewing. It's been a lovely and fairly productive day - just not the one I planned! Oh well, they say that life's what happens when you're planning something else! Oh, I also had a little email from Kerryanne at Woodberry Designs to say she'd mentioned my 'bearbies' on her blog, so HAD to have a look! Wow! Isn't it great to get wonderful feedback from someone you admire! I was rather chuffed! And if you haven't already popped in for a read of Kerryanne's blog, you really should as she has all sorts of wonderful photos of her gorgeous shabby chic painting as well as lots of interesting comments! Aren't the colours fabulous!! Now, I've said before that I am the 'anti-pink' but the green and pink combo just works so well. Besides, I did have a purpose in mind for these fabrics. They are going to help me finish the prototype for a new pattern I've designed that will be donated to Fresh Hope Patterns. We've had quite a few designers promise to donate designs, but not follow through, so I thought I'd get busy and donate another one between my own projects. I know (being one myself!) that designers have all sorts of deadlines to meet and time constraints to work under, but hopefully some more new designs will be donated soon to keep the great work of Fresh Hope Patterns going. If you'd like to find out more about Fresh Hope Patterns, a visit to the web site is well worth while!! Not only is this part of one of my fave Bible passages (1Cor, the Love chapter!) it's also the message stitched on my latest pattern. I completed the sample today and was rather chuffed with how it came up! This is the second in my newest range of Card Kit patterns and features a custom-made timber button of one of my signature bears, created for me by Lisa at Button Bliss. This little wall hanging was actually quite difficult to photograph, as getting the light right to show up the button detail meant the gorgeous purple fabric I used for borders and binding became too dark to see the depth of colour. Oh dear!! It's a challenge! I bought the fabulous purple fabric from Quilters' World here in Toowoomba when I popped in the other day and also got to catch up with Pauline for the first time in a while - she's such a busy lady that she's not always in the shop when I pop in. 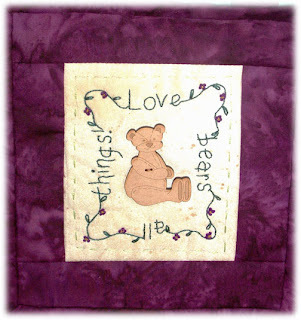 However, she not only helped me choose a suitable purple, she peeked at my pattern range and fell in love with my stitchery 'bearbies' - bears have that effect on people! - so visitors to Pauline's shop will soon be able to take a Tag Along Teddies pattern home with them to create! Wow! It was really encouraging to get such great feedback from someone who's been involved in the craft and quilting world for quite a while and, as it is hard to break into the market as a relatively new designer, having the support of someone like Pauline through her wonderful fabric wonderland is fantastic!! Stay tuned for updates on another exciting development in connection with Pauline and Quilters' World!! But for right now, this tired little teddy bear is heading for her bed - I've had a beary busy day! til next time! He had radical eye surgery to receive a set of brand new glass reproduction eyes, had his side seam re-stitched and his head more firmly attached to his body (I think I need that treatment some days!!). 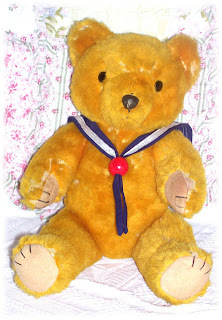 And since he's an old bear with a very English name, I thought a sailor's collar like those worn by little boys in days gone by would complete his new look. I couldn't replace the missing fur, but that just makes him look well-loved. And well-loved is just what he will be from now on! He has joined the 'retirement' room - our spare room is home to a number of old toys including a celluloid doll that was my grandmother's, then my mother's; a patched, pink dog called (originally enough!!) 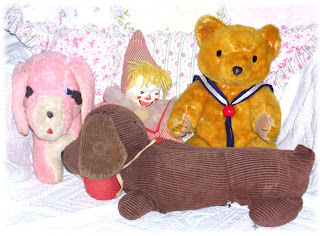 'Pinky'; a Disney clown doll my Nan won at a cent sale; and my faithful childhood companion 'Sam', a brown corduroy sausage dog who looks like he has played hard! Rupert is pictured with his new friends below, ensconced in his comfy new home. 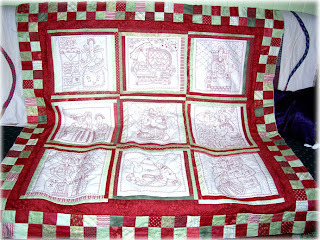 Of course, today, being Tuesday and my designated "UFO Day", also saw me working on my red and green quilt. It now has a couple of borders attached and is starting to look great - if I do say so myself!! I just have to add one more border, then bind it and it's done!! Yay! Here's the update. Today, I convinced Scott to come along with me to a swap meet and I think he's still shaking his head and thinking he got conned! The Toowoomba swap meet is one of the largest in SE QLD, with between 20,000 and 30,000 people browsing through HUNDREDS of stalls over two days. Now not all of these 'items' for sale are fantastic quality, but you've heard the saying that one man's trash is another man's treasure. And so it seems! We enjoyed (well, I enjoyed!) wandering through the rows and rows of stalls for an hour or so, before we came to the smaller show pavilion where the models were set up. We walked into a long hall that was wall to wall matchbox cars, sail boats, miniature trucks and so on. We looked ... and were heading for the door when a little flash of gold caught the corner of my eye and I said to Scott, "Wait! There's a bear!" With a long-suffering sigh (something I've given him lots of practice at heaving!!) 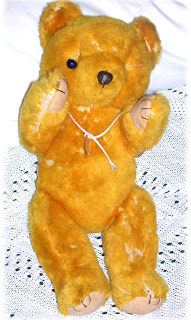 he followed me back into the hall where, sure enough, there was a bear - one bear in a room full of cars and models, and he looked desperately in need of a good home! After liberating said bear, we headed for the door at last, me nursing my new furry family member (I couldn't just stick him in a bag, you know!) and I said to my beloved, "I suppose you're wondering how I managed to find one lonely little bear in there." He replied, "Nope. I think it's a kind of built-in radar!" Tee! Hee! Hee! So, here is my new adopted family member.